If you have never visited Patagonia in September, it should definitely be on your bucket list. If you have already been, another visit will certainly be a new experience, just ask the guides there if this magical region has ever ceased to impress them. A slightly different way of enjoying your trip and having an experience unlike most who have traveled here is by taking your trip at a different time of year from when people usually visit Patagonia. The summer season in Patagonia begins in October and ends in March, but summer here also means thousands of tourists lurking around. In order to avoid these crowds, why not travel in the weeks before this begins to happen? When is the best time to visit Patagonia? 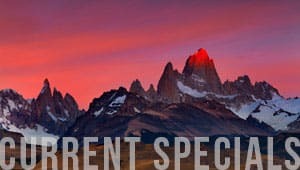 Patagonia in September is a great option, hotels are just reopening after the cold winter months and are not full up with reservations and days are quickly getting longer. The weather is unpredictable as always, but, despite the low temperatures and winds (characteristic of the warmer months), it is excellent for sightseeing, hiking and various other activities. Because of these lower temperatures (ranging from 30ºF/-1ºC at night to 50ºF/11ºC during the day on average) it is very important to have warm clothing and wind jammers at hand at all times to avoid a lousy experience due to not being well prepared. As a reference, summer temperatures during the summer months reach 64ºF/18ºC on average. One of the main advantages of this season is that the snow that has accumulated over the winter on the peaks and higher ground has not yet melted significantly, generating a spectacular panorama, with a perfect mix of greens and majestic snow-white. This snow also means cooler weather as you get higher, which is where the animals go to in the warmer months of the year. As the snow is still there, the animals are in the lower valleys, right by where you will be walking, driving or riding. This is unique to this specific time of year, meaning that your experience and close contact with the fauna of Patagonia is guaranteed. For these reasons, traveling to Patagonia in September is an excellent choice if you want a slightly different experience to what the greater majority of people live when they visit this incredible corner of the globe. For more on climate & weather ----> Weather in Patagonia.